Even if your laptop or desktop PC has one of the best and heftiest SSDs or is equipped with a powerful NAS device it doesn’t mean that you won’t need a pocket-sized flash drive that is both portable and convenient. Today there are thousands of USB flash drives to choose from. They differ in size, security level, speed and other features. Here are some tips on how to choose the best flash drive namely for you. One of the most crucial factors you always pay and should pay attention at when choosing a flash drive is its performance. Write and read speeds will affect the time you will spend waiting when transferring your files. There is a great difference between 20 seconds and 10 minutes. Remember that flash drives that support USB 3.0/3.1 show better performance than those with USB 2.0. They are usually 10-30 times faster. If you care about privacy and security of your files then choose a drive with security software. 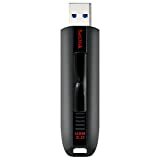 A good example can be SanDisk flash drives that are often provided with SanDisk Secure Access software. It includes data encryption and password protection. There are also flash drives that use fingerprint encryption. This technology is a combination of secure data storage space and biometric technology. Have you got a bad experience of accidental deletion of files from your flash drive? In such case, an option of file recovery is something your flash drive must have for sure. But note that very often it’s an additional option that you have to download yourself. 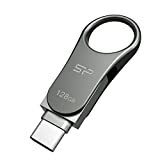 Very often one and the same flash drive with the same range of options can have different memory storage capacities varying from 16 GB up to 512 GB. But the choice of capacity depends only on your needs. If you don’t want to risk the data on your flash drive it’s necessary to take care not only of its security level but also build quality. Water drops, X-rays and even dust can damage a flash drive and this can lead to the loss of your files. In order to prevent such terrible consequences a lot of flash drives are waterproof, shockproof, dustproof, etc. Besides, a lot of them are made of very strong types of metal. Thus, it’s always better to have metal casing instead of a plastic box. OK, all flash drives are small – that’s true. Still, they all differ in size and form, and even the tiniest difference can play a role. The choice of size, as well as memory, depends on your preferences, special needs and requirements. This flash drive is compact and quite cheap. It has read speed of up to 245 Mb/s and write speed of up to 190 Mb/s. As you can see it isn’t a time consuming USB drive, so you can spend your precious minutes doing whatever you like. In fact, it’s one of the most important features every best flash drive must have because no one likes waiting. We also appreciate the fact that this streaming device comes together with SanDisk Secure Access software. It’s not bad to have 128-bit AES encryption and password protection to keep your files safe from peering eyes, isn’t it? And note that at the same time you leave the access to the rest of the streaming device. 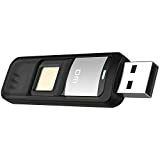 SanDisk Extreme CZ80 is also backward compatible with USB 2.0 and is suitable for PC and Mac computers, as well as tablets, TVs and car stereos. What is more, this is definitely an example of best flash drives as it includes such option as file recovery. Thanks to RescuePRO Deluxe Software you can save the files that have been accidentally deleted. But remember that you will need to download this software yourself. If you need something really special, something that will have enough memory for all seasons of your favorite TV show then PNY TURBO 256 GB is namely for you. This flash drive is the best 256 GB streaming device. Such compact drive in your pocket can hold up to 47,349 songs. Besides, its 3.0 USB technology will transfer files much faster than its previous 2.0 version. Still, you can easily rely on it when using 2.0 USB ports. Its design deserves your attention as well. It is stylish with a sliding collar and has an integrated loop – special for key chains. And even if something goes wrong you can always count on its free technical support. OK, even if you’ve found out that 256 GB of PNY TURBO streaming device isn’t enough and keeping several drives is not for you, don’t get upset – just buy Patriot Supersonic Rage 2 with 512 GB. This flash drive transfers files with up to 400 MB/s read speed and has up 200 MB/s write speed. As to its build, Patriot Supersonic Rage 2 has a reliable slide that protects the drive from different damages. Thanks to its rubber coating this streaming device is not afraid of drops and spills. In a word, it’s a durable drive that can serve you long years. By the way, it’s one of those flash drives that are compatible not only with Windows and Mac OS but also Linux (2.4). And if you don’t need such great RAM you can purchase 256 MB or the most popular 128 MB Patriotic Supersonic flash drive. It’s a compact flash drive that is suitable for holding it in the tiniest pockets of your clothes. Such small size is especially appropriate for compact notebooks and tablets with USB ports. What is more, Kingston Data Traveler is a solid product that is made of metal and has a five-year warranty. It also has a hefty ring for being attached to your keys. Keep in mind that this flash drive doesn’t support USB 3.0 and works with USB 2.0 only. But its price will definitely compensate this feature. The point is that Kingston Data Traveler has a low price of less than $15. That’s a great bargain if you want to save money. Here’s another streaming device which can offer you up to 512GB. But unlike Kingston Data Traveler this drive supports USB 3.1 Gen. 1 and at the same time is backwards compatible with USB 3.0 and USB 2.0. It’s not the fastest flash drive you can find on the market and has up to 380 MB/s read speed and 70 MB/s write speed. So, if you prefer something faster then it’s not for you. However, Patriot Supersonic Mega has some other features you will appreciate. This flash drive has tough industrial strength zinc alloy housing what makes it one of the most durable streaming devices. 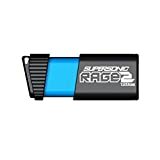 As well as Patriot Supersonic Rage 2 this drive is also compatible with Linux OS. The name of this flash drive speaks for itself. SanDisk UltraFit CZ43 is super compact and a result rather convenient in use. Such tiny size is suitable for all types of desktop PCs, laptops and especially notebooks. SanDisk flash drive supports high-speed USB 3.0 and its read speed can reach up to 150MB/s. In fact, you can transfer a full-length movie in less than half a minute and that’s 15 times faster than USB 2.0 drives can offer. 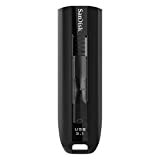 Besides, you will be always able to keep your files safe and private as this streaming device is provided with SanDisk Secure Access software. Almost all SanDisk products include such options as Password protection and 128-bit AES encryption software. By the by, SanDisk UltraFit CZ43 isn’t an expensive model. On the contrary, it is one of the best budget flash drives you can get nowadays. One more example of best USB flash drive is Samsung BAR Metal Flash Drive. This is a stylish streaming device with high-grade metal casing and a key ring. Still, these aren’t the only features that make this drive a durable product. Thanks to its NAND Flash Technology Samsung BAR metal streaming device is also water proof and shock proof. What is more, it is magnet proof, temp proof and even X-ray proof. So, there is no surprise that Samsung gives a 5-year warranty on this flash drive. This USB flash drive supports USB 3.0, what guarantees high read and write speed. Still, it’s also compatible with USB 2.0 ports. And note that you get all these options for quite a reasonable price. 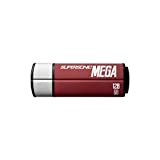 This is one of the best flash drives you can get for your iPhone or iPad as it was designed namely for this type of products. SanDisk iXpand has a flexible connector that can fit through almost all iPhone cases. Having such flash drive you will be able to back up photos, videos and contacts from your camera. By the by, all videos captured from within the iXpand Drive app will be automatically saved to the drive. However, keep in mind that SanDisk iXpand streaming device is not compatible with old iPhone and iPad models equipped with 30 pin data/charging connectors. Besides, compatibility with lightning to 30 pin adaptors isn’t guaranteed as well. SanDisk iXpand is a nice drive to free up space on your device. It’s compact and portable. And by the by, it’s also compatible with computers. This streaming device was included into our list of best flash drives thanks to its high protection level. Farsler USB stick is provided with fingerprint encryption. Such technology is a combination of secure data storage space and biometric technology. So, if you want to prevent anyone’s attempt to access your data without your permission then this drive will be a good choice. Apart from this, Farsler Fingerprint is provided with high-speed identification. There is fast fingerprint recognition, plug-and-play process as well as files transferring. Farsler Fingerprint has also got dual storage. The point is that this flash drive includes public and hidden sectors (aka public and secure). Thus, you can decide what files are presupposed only for private viewing and what data can belong to the public sector. So, if you want to get the access to hidden files then you have to pass through the fingerprint authentication. As well as Samsung BAR Metal this flash drive is aimed to make you feel confident in their product. Silicon Power C80 is protected against dust, vibrations and water thanks to its COB Technology. Apart from this, it has 360° swivel cap design, so there is almost no chance to lose your USB cap. Besides, it is provided with lifetime warranty but in order to get an access to all privileges you have to register your product on SP official website. This action will allow you to get the complete manufacture warranty, services and tech support. There is also dual interface of USB Type-C and a standard Type-A 3.0 ports. So, Silicon Power C80 is suitable for smartphones, tablets and Macbooks. What is more, having this flash card you can add extra storage to your Type-C ready mobile devices. There is also a free file management App “SP File Explorer” that provides such options as automatic file categorization and one-touch backup. The first thing that catches your eye when you have a look at this USB flash drive is its form and style. Corsair Flash Survivor Stealth is hard-anodized and has aircraft-grade aluminum housing with EPDM water seal. What is more, this flash drive has a molded shock damping collar and limited 5 years of warranty. Corsair Flash Survivor Stealth shows fast performance. Thanks to its USB 3.0 support you can watch most videos directly from the drive – there’s no need to copy them to a hard drive. Note that at the same time you can rely on its USB 2.0 compatibility as well. This USB flash drive is compatible with Mac, Windows and even Linux operating systems. There is also customer support available, so if you’ve got any technical problems you can always call or email Corsair. Here’s one more example of flash drive from SanDisk family. Extreme Go was included into the list of best USB flash drives thanks to its fast performance. This streaming device supports USB 3.1 that provides both fast read and write speed. In fact, it is 35 times faster than USB 2.0 flash drives, so you van transfer 4K movie in less than one minute. SanDisk Extreme Go has also got a nice design that is aimed not only to make the drive look stylish but also to protect it from different damages. Apart from this, it is provided with Secure Access software that presupposes password protection. What is more, there is an option of RescuePRO Deluxe data recovery download. Of course, flash drives can’t offer as much as external hard drives can, for example. Still, their compact size is the main reason why everyone purchases them. And whatever flash drive you choose, remember that it must correspond to your personal needs. It’s always up to you to decide which streaming device is the best for you. This article feels like regurgitated facts from other articles and spec sheets. We need someone to do some real tests and make consistent comparisons. Write speed is the critical factor with large drives, and we need some real life testing. That means not only a couple of huge files, but also copying thousands of small files such as backing up a hard drive. And to report not only the speed, but the storage used. There is anecdotal evidence that flash drives can use up to twice the storage when storing lots of small files. Heat should be consistently reported. It was noted as a con with a Samsung drive and one other but not mentioned for the others. That is not entirely credible. In fact, the Samsung drive has an all metal case ideal for dissipating heat, so it may feel hot on the outside while actually cooling the inside more effectively, just a thought — but anyway really accurate measurements of temperature/heat are needed for each device if it is going to be considered. Reliability is very important and also very difficult to gather data on. But somebody should be stress-testing these top contenders over time to get some idea on failure rates. It seems like it wouldn’t cost that much to really test these drives and give us some trustworthy data that truly reveals the differences and similarities and tradeoffs. The SanDisk PRO gives you blistering speeds, offering 420 MB/s on the reading front and 380 MB/s on the writing end, which is 3–4x faster than what a standard USB 3.0 drive will offer.